TROY, Mich.--(BUSINESS WIRE)--LG Chem Ltd., a global leader in lithium-ion batteries for automotive, stationary and consumer applications, has formally launched its range of award-winning residential battery systems in the North American market. The launch follows successful completion of UL certification and represents LG Chem’s initial foray into the North American residential market. Since 2013, LG Chem has been at the forefront of providing residential battery storage (RESU) systems and has earned a strong reputation for quality, reliability and dependability. The commitment to delivering quality products and services has resulted in excellent annual growth and new business throughout Europe and Asia, especially in Germany, Italy, the UK, as well as Japan and Australia. 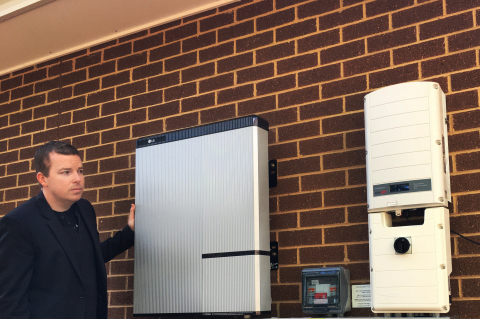 The residential systems’ pioneering features were recognized with the ees AWARD 2016 and, in the fast-growing Australian market, LG Chem has quickly established itself as the market leader according to EuPD Research. High-voltage 400V: with capacities of 7.0 and 9.8kWh. The 400V RESU10H (9.8kWh) product is compatible with SolarEdge’s StorEdge™, which is a DC coupled storage solution based on a single inverter for both PV and storage. Additional inverter compatibility options will become available later in 2017 to provide homeowners with a range of pre-tested solutions from the industry’s leading suppliers. LG Chem’s residential batteries will be available via a number of leading solar/storage providers in North America. Following last year’s announcement of a partnership with LG Chem, Sunrun – one of the leading U.S.-based residential energy system providers – will be supplying LG Chem’s RESU systems. Sunrun already has installed initial systems in both Hawaii and California. Additional distribution channels are in advanced negotiations and will provide coverage to all U.S. states and Canadian provinces. Advanced, safe and highly reliable automotive quality lithium-ion battery cells are used throughout LG Chem’s range of residential and grid-scale battery systems. LG Chem has been awarded 82 projects from 28 global automotive OEMs as of September 2016, and deployed Gigawatt-hours of global stationary battery projects. LG Chem, Ltd. is a large diversified chemical company which operates via three main business units: Petrochemicals, IT & Electronic Materials, and Energy Solutions. Based on the many years of experience in the development and production of batteries, LG Chem is a global leader in energy storage systems. As such, the company is a primary supplier to the mobile/consumer and automotive industries. Entering the stationary energy storage business in 2010, LG Chem has developed an unparalleled reputation for quality, performance and dependability across all market segments: grid-scale; C&I residential; and UPS. LG Chem manufactures cells in Korea, China, and the United States, and has regional support teams in the U.S. and Europe.